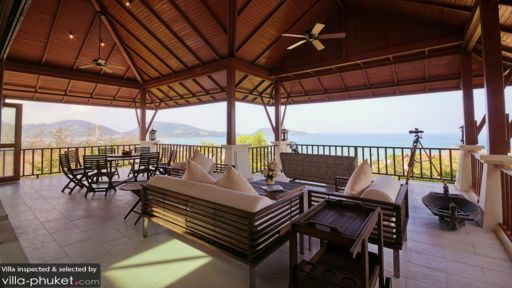 Patong beach is home to L’Orchidée Residences which is a private villa complex in Phuket close to the trendiest patch of sand with exciting restaurants, beach bars and clubs for your entertainment. 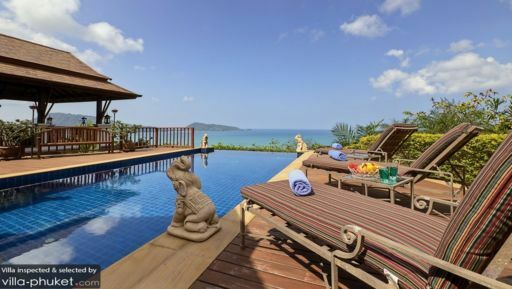 Apart from a bustling nightlife, Patong offers a calm and serene tropical ambiance that guests can enjoy from Villa Phala 1, a three-bedroom holiday rental located in the middle of the private estate. With an infinity pool overlooking Patong bay and a traditional Thai relaxation sala with Jacuzzi, the villa is quintessentially heaven on earth! Villa Phala 1 is located over two levels, and the ground floor is where you will find the three, well-appointed bedrooms. With two master bedrooms, one with a king-sized bed and the other with a queen-sized bed, you will find the accommodation suitable and comfortable. The two bedrooms extend out to a private balcony which is furnished with chairs from where guests can enjoy the view while sipping on some hot tea. Each bedroom has an en-suite bathroom with a whirlpool tub for tranquil baths. The third bedroom is furnished with a queen-sized bed and also has its own en-suite bathroom for your convenience. A stunning view and an infinity swimming pool is a recipe for a great time in Phuket. As you chill in the crisp, cool waters of your private swimming pool, all the while gazing at the mesmerizing view of Patong bay and the lush vegetation, you are bound to feel rejuvenated and all your worries will seep out of your body. There are stone sculptures feeding the pool and right behind it you will find the Thai sala which houses a wonderful dining area from where you can enjoy the endless view, or relax in the Jacuzzi. Sun loungers is for those who wish to sunbathe under the tropical sun or simply take a nap. The open-concept living area at Villa Phala 1, has foldable glass doors that let you enjoy nature even when you’re indoors. You could leave the doors open to the pool terrace and enjoy the fresh, summer breeze and the stunning view right from the comfortable sofas and daybed in the living room. The living area features high-soaring ceiling with wooden beams for a Thai touch, and the polished wood floorings give the room a cozy and inviting vibe. In the corner, you will find a lounge with plush couches and a massive flat-screen TV, for entertainment. Out on the terrace, you will find an alfresco dining table overlooking the gorgeous view, and indoors there is another eight-seater dining table for guests to enjoy their food while together with everyone. A fully-equipped kitchen with modern appliances is at your disposal for you to use in order to cook your meals or light snacks. L’Orchidée Residences offers an internal shuttle service to take guests around the different spots in the complex like the gym, common pool, or the kids’ area. The staff at the villa is friendly and accommodating, catering to all your needs without a fuss. At extra cost, a chef can be arranged to prepare you meals, you can indulge in in-house massages, and even get a chauffeur-driven car. Patong beach is where all the fun lies with the most popular beach bars and night haunts that you can visit well into the night. Relax and sunbathe on the beach or explore the nearby areas on foot, for an enjoyable experience. Some bars and restaurants to try out include Joe’s Downstairs, White Box, and Pan Yaah. We spent 1 week of our summer vacation in one of the Villas at L'Orchidee. We were pleasantly surprised when we arrived, so close to Patong, but without all the noise and crowds. The views were stunning and the villa was very large and well appointed. We were with a couple of other families and the kids loved the pool communal area as well as the pool in one of the other villas that had its own large pool. Our villa had a small plunge pool where we could relax away from the kids. The management were helpful and friendly and had some good recommendations of local places to eat and shop. All the staff in the complex are very friendly and willing to assist. Would definitely recommend it for families, especially families travelling together.